Planning a Virginia Beach Vacation? Planning a Virginia Beach vacation? 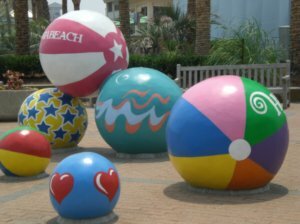 I've put together everything you need to know to plan your Virginia Beach family vacation getaway in one of the friendliest, most relaxing, and exciting places on earth. And I'll show you how to do it all for less, saving you money on vacation rentals, food, attractions, theme parks, and more! 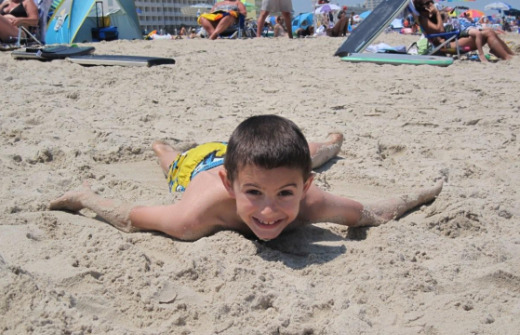 Alex loves making sand angels at Virginia Beach! Virginia Beach is Virginia's most populous city, with more than 435,000 people. It's also one of the largest Virginia cities in physical size, stretching from the shore of Chesapeake Bay to the Virginia/North Carolina border. Virginia Beach boasts 28 miles of shoreline, but those 28-miles run the gamut, from the southern foothold of the Chesapeake Bay Bridge-Tunnel, to the glitz of the oceanfront resort strip, to the sheer remoteness and quiet beauty of False Cape State Park. In between, you'll find First Landing, site of the first landing in the New World by the Jamestown settlers, two inlets, American military bases, multi-million dollar homes and lovely suburbs, countless shopping spots and malls, attractions, and more. The resort strip is crowned by Virginia's tallest building, the 500+ foot Westin Hotel. Atlantic Avenue, one block west of the beachfront, is where the action is. It runs north and south to provide almost 40 blocks of shopping where you can buy tourist, gift, and beachwear items, get your hair done in an authentic Caribbean hair wrap, rent bicycles and roller blades), local free museums like the Atlantic Waterfowl Museum, and attractions like Jungle Golf, and Motorworld. South of the resort strip is Rudee Inlet, the protected home of thousands of moored boats and yachts. It's also the home of fabulous seafood restaurants like Rockafellers and Chicks, so you can enjoy fresh seafood while watching the sun set against the sails. Rudee Inlet is also where you can find charters for deep-sea fishing, rent jet skis or a kayak, go parasailing, or look for treasure on the Pieces of Eight pirate cruise. Here's what you need to know about Rudee Inlet. West of the resort strip, the adventure continues. You can take the VB Wave Trolley from Atlantic Avenue to attractions like the world-class Virginia Aquarium, with over 300 hands-on exhibits and one of the only interactive seal programs in the nation. Serious golfers can take advantage of three different golf clubs to choose from on their Virginia Beach vacation. Not so serious "golfers" will prefer Jungle Golf, a jungle-themed miniature golf course only a few blocks from the beachfront that lets you play all day for one price. If you really want to get the adrenaline flowing, Laser Quest is live action laser hide and seek-- like paint ball but without the mess! If it's hot and you want to cool off and enjoy the great outdoors, you can spend the day at the wet and wild Ocean Breeze Water Park with its 16 slides, a wave pool, and a Buccaneer Bay water playground. Motor World is a one-stop spot for excitement, with go carts on 11 different tracks, a paintball course, Shipwreck miniature golf, and "Skycoaster" which lets you "fly" through the air. Love to camp? Looking to enjoy a Virginia Beach vacation without high hotel prices? Campers can take advantage of a variety of campgrounds, ranging from the Back Bay Wildlife Refuge, to the historic First Landing State Park, to the full-service Virginia Beach KOA campground (which features marshmallow roasts and flashlight candy hunts, and is conveniently connected to the beachfront by the VB Wave Trolley). Ready to shop in Virginia Beach? Shoppers can choose from several malls, the Shops at Hilltop (at just two miles from the strip, it's the closest to the beach area), Red Mill Commons, Lynnhaven Mall, and the new Virginia Beach Town Center (home of upscale stores and a Cheesecake Factory! ), just to name a few. You can visit the set of religious broadcaster Pat Robertson's CBN 700 Club at nearby Regent University. If you're looking for something different for your Virginia Beach vacation, you can take a tour of Oceana Naval Air Station, the Navy's main air station on the East Coast. Watch for the amazing Navy F/A-18 Super Hornet jets roaring overhead. (You can't see them as often as you used to at the beachfront thanks to complaints by the locals.) In fact, thanks to Oceana and the nearby Norfolk Naval Base, military members and their families make up a good 30,000 of the area's population. 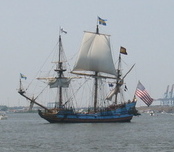 Take a pirate ship cruise...right off Virginia Beach! 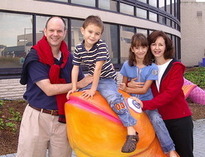 You can find just about everything for a Virginia Beach vacation accommodation. Choose from full-service luxury oceanfront beach hotels like the top-rated Springhill Suites Virginia Beach Oceanfront, to budget-conscious spots like Sundial Motel & Efficiencies, to B&B's like the cozy Angie's Guest Cottage. Or, find a home away from home with a spacious Virginia Beach rental or timeshare. Eating out is a big part of a Virginia Beach vacation, and the area's restaurants won't disappoint...particularly if you love seafood that gives a new meaning to the word "fresh." 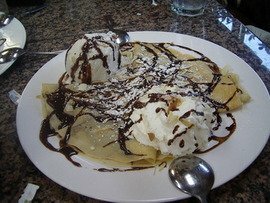 We've prepared reviews of some of our favorite restaurants--including some which will fit any budget--and will show you how you can enjoy even top restaurants for less if you use our tips (click on the "Best Restaurant Deals" below). For an overview of the area's climate, and today's accurate forecast for weather and surf conditions, click on the "Weather" link below. 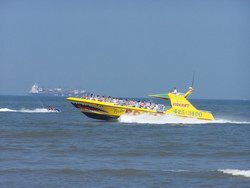 We've also put together important information you need for your Virginia Beach vacation--including local speed traps, best places to buy gas, and the best local visitors guides you MUST pick up--on the City of VB link below. Virginia Beach is serviced by three major airports: Richmond International Airport (RIC), which is about 1-1/2 hours west of the beach, Williamsburg-Newport News Airport(about 40 minutes west), and Norfolk International Airport, which is the closest to the beach area. Getting the best cheap flights for your Virginia Beach vacation depends largely on where you're flying from. We've got an exhaustive page on Richmond International Airport (where we find the best deals). We'll have pages on the other two area airports soon. We also have a page on the VB Wave Trolley, including fare info and routes.